Baldwin Ko graduated with a Master’s degree in real estate in Sydney, Australia. He returned to Hong Kong to work in commercial real estate, managing two of the city’s largest luxury shopping malls. It was a great opportunity, and one of the malls—the famous Festival Walk—was the biggest in Hong Kong at the time. However, after the Asian financial crisis gripped the entire region, most of the mall remained vacant after opening. Within one year, Baldwin managed to achieve 100 percent occupancy. At the turn of Y2K, the Internet boom infused life into the retail market. Soon after that, another crisis wiped out business like a bad virus. It was, in fact, the SARS virus. Around 2003, Baldwin had to reconsider how to survive in an industry so vulnerable to crises and fluctuating markets. Looking at the situation analytically, he studied successful tenants and evaluated what factors had contributed to their industries’ success. Jewelry was an interesting avenue to explore, but it demanded too much capital up front. Fashion was another option, but Baldwin observed drawbacks in that field as well. The chocolate business, however, had weathered the economic storms of Hong Kong—so much so that some of the bigger brands doubled in size year to year in spite of economic crashes, drops, and crises. For a couple of years, Baldwin explored chocolate brands around the world, both big and small, considering which ones might appeal to the Hong Kong market. One of his retailer friends from agnès b. fashion was moved by Baldwin’s passion for chocolate and invited him to approach the designer agnès herself for a crack at a business opportunity. Eventually, Baldwin received the license to sell chocolate under the brand. But what exactly did it mean to create a chocolate brand? The agnès b. brand license was granted to Baldwin in May 2007, and the first store was scheduled to open that October. Five months before the grand opening, he had neither a concept nor chocolatiers. Baldwin hired top talent from a leading chocolate company who ended up bringing their own business philosophies and company culture along for the ride. Baldwin characterizes the other chocolate company as packaging focused rather than product focused. They were accustomed to repackaging their chocolates with slight variations, and they ended up overlooking the quality, origin, and training behind the chocolates themselves. It was plain to Baldwin that they were speaking different languages, and that the philosophies brought from the other company didn’t jibe with the agnès b. brand. “If you are selling wine to a customer for a premium price, would you simply change the label on the wine to diversify your product?” asks Baldwin. He soon realized that he needed to be more intentional about creating an enduring culture. Baldwin shared some insights into the process of transforming his vision into the day-to-day operations and long-term success of a chocolate company. He’s experienced both triumphs and struggles, and considers many aspects to be works-in-progress. Culture is not plug-and-play: Like the appreciation for fine wine or chocolate, it’s cultivated over time. Here’s a look into Baldwin’s experience. Baldwin emphasizes the importance of chocolate knowledge in his current initiative, from the executive level to retail sales and all the way to the customer. The retail manager he hired from agnès b. had a background in sales and revenue and did a great job at moving the product. Ultimately, though, she lacked a passion for chocolate and overlooked the intangibles of what it meant to sell artisan chocolate. When Baldwin interviewed his front-line staff, he realized that there was a huge disconnect between the main office and retail sales, and his message was not being delivered to the customer. For example, why was a specific combination of nuts and chocolate created? Sales people needed that knowledge in order to answer such questions. Educating his team and customers so that they all have an understanding of and passion for chocolate became key to Baldwin’s company culture. This approach also serves to reinforce his brand: he was willing to hire and fire by those values. I had so much fun during my interview with Baldwin. 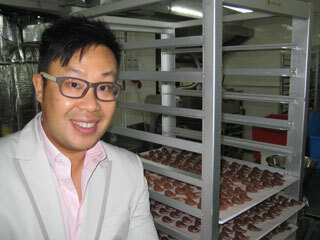 We toured his stores, his chocolate factory, and did the obligatory taste test (yummy!). I think Baldwin hit the nail on the head when it comes to passion. You either have passion for the company and job or you don’t. It’s okay if you don’t, but then it’s not the right fit for the company. On top of asking candidates how they resonate with our values, I also dig into their passions. What do they like to do outside of work? What gives them energy at work? What drains their energy? And then simply ask them why they would be excited to come to work on a daily basis to delight our customers. I know I can’t fake passion, nor do I want any employees to fake it either. In Asian culture, it’s common for business owners and employees to hold their cards close. Baldwin realized that his managers showed up to company meetings to just passively listen to him talk. Surprisingly, one of his managers even thought that if she didn’t speak up, then no one would intrude on her department. It took him a few months to readjust employee attitudes. They started to actively bring issues to the table and began resolving them with support from one another’s departments. Recently, Baldwin started sharing company financials with his key managers. He hopes this empowers his staff with a sense of ownership and accountability towards the healthy overall growth of agnès b. DÉLICES. Baldwin deliberately makes himself approachable and encourages honest dialogue to spark change and improvement. The company’s retail employees are receiving more in-depth training about chocolate and how it’s made. Corporate employees are visiting the retail stores and receiving training that is more professional. Baldwin makes personal enrichment a part of his company culture, rather than just something that is nice to have. Baldwin admits that he’s still evaluating and re-evaluating his company culture, and constantly adjusts the magic recipe towards attaining ultimate company success. I discovered that the agnès b. DÉLICES brand, chocolates, and company culture all have a complexity and sweetness that didn’t come about by accident. Baldwin struck me as a cross between Hugo Boss and Willie Wonka, bringing a blend of wisdom, fun, sophistication, and creativity that is reflected in the candy delights of his entrepreneurial dreams.